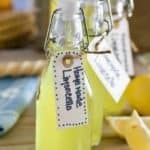 How to Make Homemade Limoncello! – Booze, the gift that keeps on giving! This incredibly easy to make liquor will put a smile on the face of everyone you gift it to! Three simple ingredients. Lemons, of course. Along with vodka and some sugar and water to make the simple syrup. Mixed together it makes a delicious and smooth tasting grown up treat! See Recipe Card for printable instructions below. Step 1: Remove the yellow rind from the lemon, leaving the white stuff. The pith on the lemon is bitter. The easiest way to do this is with a potato peeler. Step 2: Add the lemon rind straight to the bottle of vodka and store in a cool dark place for 4-5 days. 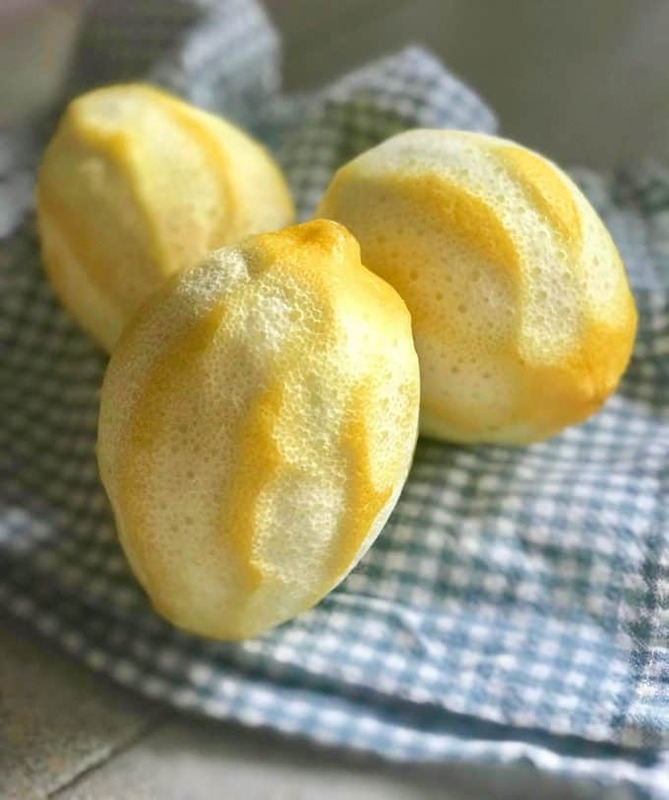 What to do with all those naked lemons? Try this delicious salad dressing or Lemony Orzo Pasta! Normally I add a drop or two of yellow food coloring to keep it from looking like a medical sample…ewwww! If your lemons give off a ton of color you may not need too. I like the brightness that even one drop of the food coloring adds. I purchased the cute little bottles here and the tags at a craft store. About the vodka – I go cheap and cheerful. Not bottom shelf, not top shelf….just somewhere in the middle. NOTE: There are recipes that use whole grain alcohol for Homemade Limoncello. My thought on that is this it is pretty potent already and it goes down really easy. I wouldn’t feel to good about my fave people getting too tipsy…kinda ruins the fun and the gift. Step 3: When your vodka is ready and full of lemony flavor, strain through a cheesecloth. Combine the water and sugar in a large sauce pan to make your simple syrup. Bring to a boil and stir. Simmer for a minute or two until all the sugar has dissolved. Let cool completely. You can store in the refrigerator until you are ready to mix your Limoncello. Step 4: Combine simple syrup and steeped vodka. You may not use all the simple syrup. It’s up to you and your tastebuds on how much to add. I use one cup of syrup to two cups of vodka. Tasting is the best way to tell…I love my jobbbbb! If desired, add yellow food coloring one drop at a time. 3-4 drops for the entire batch should be adequate. 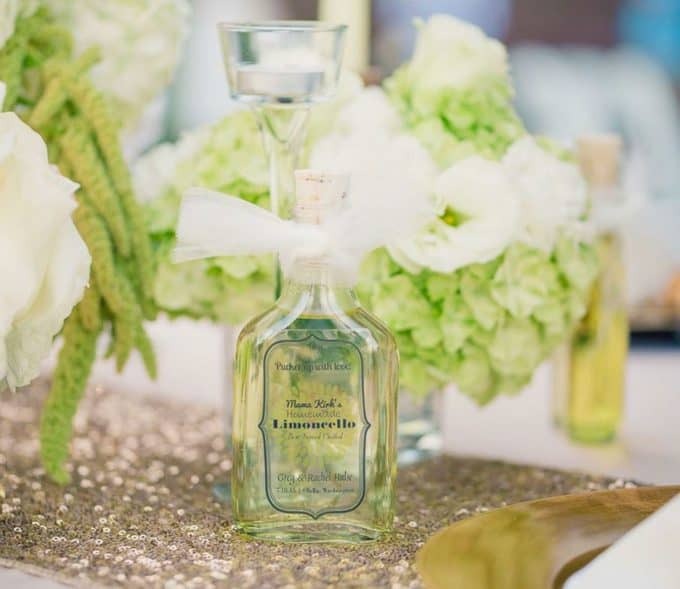 We made bottles and bottles of this stuff for our daughters wedding and it was a total hit! Rachel ordered labels from Etsy and each guest got a little bottle at their table. We filled the kiddo’s bottles with jelly beans…sooo cute! To keeping the family smiling at the holidays! More boozy gifts? 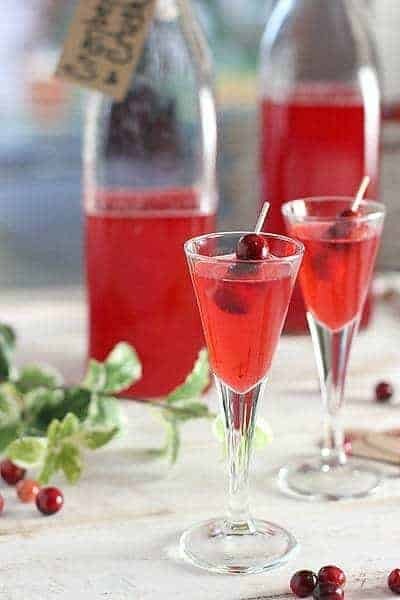 How about this Overnight Cranberry Crush. When you don’t have 4-5 days to steep lemons, this is a great colorful gift! What do you think about this recipe?Have questions?Comment below!Don’t forget to like us on Facebook, and connect with us on Instagram and tag your @Laughingspatula recipes with #laughingspatula,while you’re at it…We love to see your pics! Hey and check out our new YouTube Channel! This easy and impressive liquor takes only a few ingredients to make! Remove the rind from the lemons using a potato peeler, and add to the vodka. Let sit in a cool dark place for a minimum of 4 days. You can soak this for a month if you like, and I have done that! But there is no additional intensity of flavor. The peels give all they got in the first few days. When your vodka is ready, strain through cheese cloth to ensure a bright and clear liquor. Combine the water and sugar in a large sauce pan to make your simple syrup. Bring to a boil and stir. Simmer for a minute or two until all the sugar has dissolved. Let cool completely. 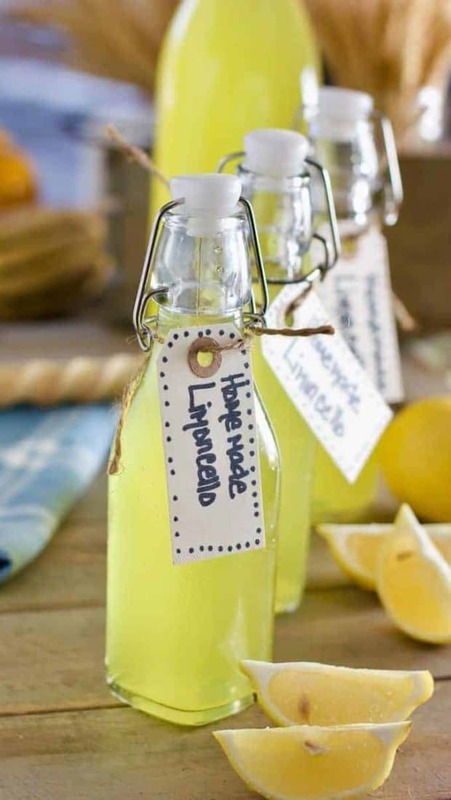 Store in refrigerator until you are ready to mix your Limoncello. Combine simple syrup and steeped vodka. You may not use all the simple syrup. It's up to you and your tastebuds on how much to add. I use one cup of syrup to two cups of vodka. Tasting is the best way to tell...I love my jobbbbb! Add yellow food coloring one drop at a time. 3-4 drops for the entire batch should be adequate. After your Limoncello is done. Store in airtight bottles in the refrigerator for up to 3 months. Turns out booze has a really long shelf life! This post may contain affiliate links, which means I might receive a very small commission, at no additional cost to you, should you chose to purchase that linked item. I only link to items I know and trust. Thank you for your support! Clink! Hi. Quick question. You said you gave these as gifts, which I assume means they weren’t refrigerated. How long can they stay unrefeigerated? I’d like to make this for holiday gifts but all the recipes say to chill it. Is that just because of the way it’s served? Hi Michelle – yes, I meant serve chilled. I have stored it up to 3 months with no problems at room temp but if you can, store it in the refrigerator. I only say that because I don’t know the safety recommendations for storing simple syrup. The alcohol will last forever but once mixed with the syrup it changes. Hope that helps a little! How many ounces is a serving? The recipe makes about 80 ounces so 24 servings at about 3 ounces each. I have updated the recipe card and thanks for the question! I have a question. 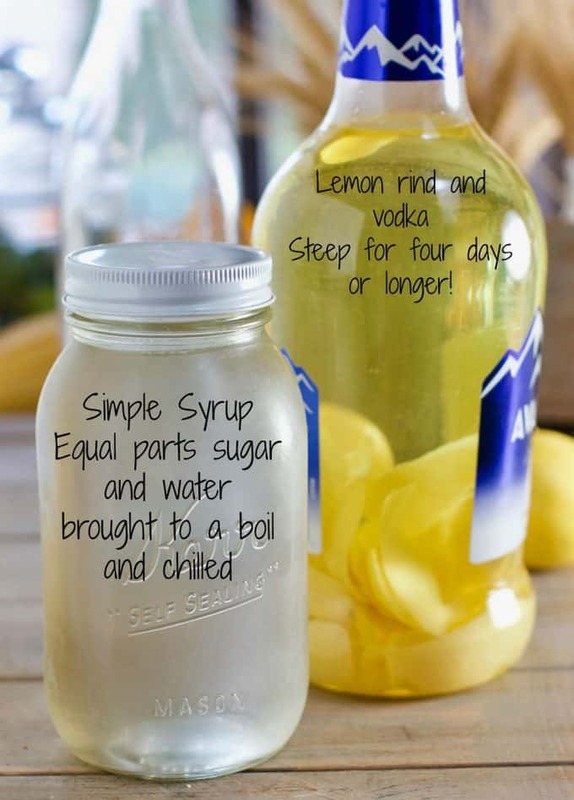 Can you make the simple syrup with the lemon juice and add that to the lemoncello? Hi Chris – there is no lemon juice in this recipe. The lemon flavor comes from steeping the vodka in the lemon peels. If you added juice to the simple syrup it would make the limoncello cloud so I wouldn’t recommend it. Being Italian, our family loves Limoncello! What a great ‘Hostess Gift’ this will make, when we’re visiting our relatives & friends throughout the Holiday season. 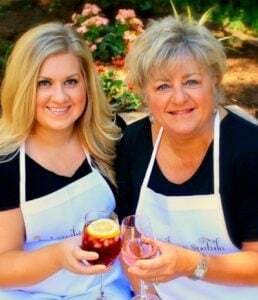 Thank you Kathi, and have a Very Merry Holiday Season with your loved ones. Thank you Angela! Merry Christmas to you as well! Interesting. We’ve made limoncello before, using pure grain alcohol, and letting it sit for 3 months. Didn’t know to use simple syrup, and it was really difficult to mix in the sugar. 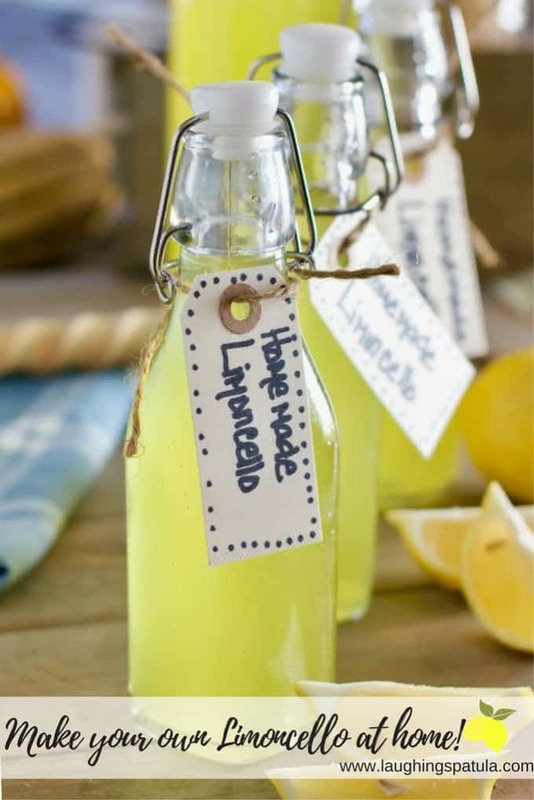 I think your way of doing limoncello would be much easier to drink as well as to make. Hi Susan! that pure grain alcohol can sneak up on ya! I hope you get a chance to give my recipe a try. I would love to know what you think :).